George Harrison was a British singer/songwriter/musician and was the lead guitarist with The Beatles, of course. Harrison was born in Liverpool on the 25th February 1943 and died on the 29th November 2001. Although most Beatles songs were Lennon-McCartney compositions, Harrison did contribute much material such as ‘Here Comes the Sun’, ‘While My Guitar Gently Weeps’ and the classic ‘Something’. Although George Harrison had a sense of humour and did do interviews, he became known as the Quiet Beatle. Harrison was born at 12 Arnold Grove, Liverpool, England. His mother was Louise and she was a shop worker while his father, Harold, was a bus conductor. He had two brothers and one sister. The house was cold and only had a single coal fire as a source of heat and it still had an outside toilet. However, in 1949, the family moved to a better quality council house at 25 Upton Green, Speke. George attended Dovedale Primary School from the age of 5. Then from the age of 11 he attended Liverpool Institute High School for Boys until he was 16. 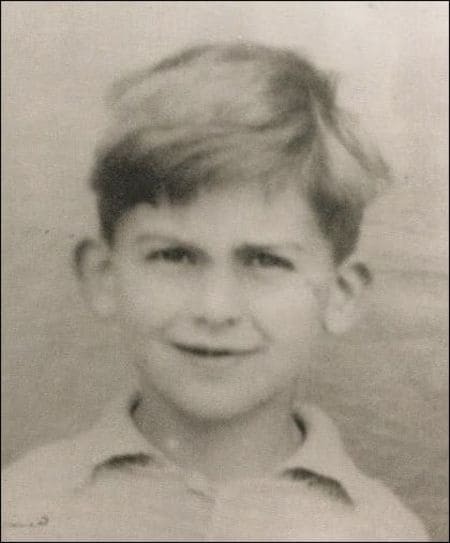 Since he regularly took the bus to school, he met up with Paul McCartney on these bus rides. Paul McCartney also went to the same high school. So, while on the school bus trip, they would regularly chat about music. There were many musicians that young George took an interest in. For example there was George Formby and Hoagy Carmichael. But in the 1950’s Slim Whitman, Carl Perkins, Lonnie Donegan and Elvis Presley began to impress him. Even though George’s father couldn’t foresee a musical future career for his son, he did buy an acoustic guitar for him. Indeed, he even allowed his friend to teach him how to play it. George’s talent grew so much that he formed a skiffle group with his brother Peter and a friend, Arthur Kelly. Furthermore, they called that band, The Rebels. At the age of 15, George got an invitation to join the Quarrymen after Paul McCartney introduced him to John Lennon. At first, however, John Lennon thought he was a little too young. But, after a second meeting and audition on the upper deck of a Liverpool bus, George passed the test. Paul’s influence paved the way for George into the band. But in the early days, George would only fill in with guitar work when needed. However, he proved to be a valuable member of the group and became the number one guitarist for the band. Because of his early influences, Harrison used the name ‘Carl Harrison’ while on the group’s first Scottish tour in 1960. 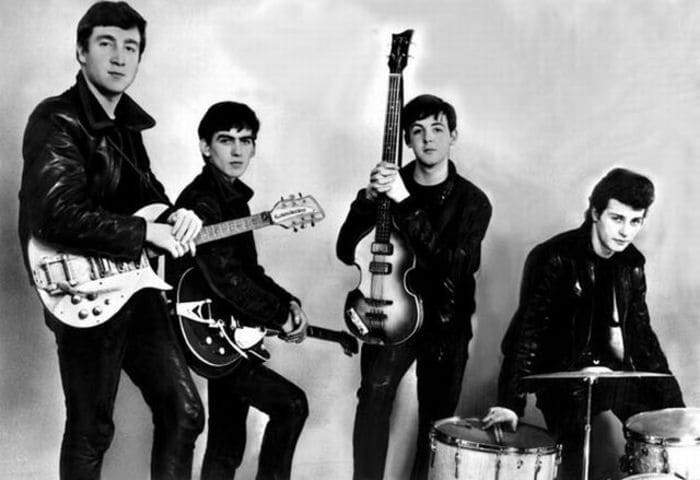 In 1960, The Quarrymen changed their name to The Beatles and took up residency in Hamburg Germany. It was their manager, Allan Williams, who negotiated the gigs. However, the Germans deported George on this first trip because he was too young to work in the nightclubs there. So, that residency ended sooner than expected. But, a year later, the band was back in Hamburg. Then, by 1962, they had a new manager in Brian Epstein who saw a lot of potential with the band. Brian Epstein won The Beatles a recording contract with EMI. Indeed, shortly after the band’s first album ‘Please Please Me‘ hit the shops, Beatlemania was upon us. And the rest they say, is history! By 1968, The Beatles were showing signs of stress and by 1970 the band broke up for good. However, during that spell, the individual Beatles were developing their own styles. In this case, George Harrison released two albums, ‘Wonderwall Music’ and ‘Electronic Sound’. Obviously, with all the talent each band member had, when The Beatles broke up, they could then do their own thing with ease. In late 1970, George Harrison released a triple album called, ‘All Things Must Pass’. In fact, many people consider this to be his best work. However, during the post-Beatles days, George would be very creative and release much of his own material. Imagine a super group made up of George Harrison, Jeff Lynne, Roy Orbison, Bob Dylan and Tom Petty. This happened after George formed a new band in 1988 called The Traveling Wilburys. After Roy Orbison died in December, the remaining band members recorded together until 1991. Of course, there are many pieces of Harrison’s work where we can hear the Indian influence. 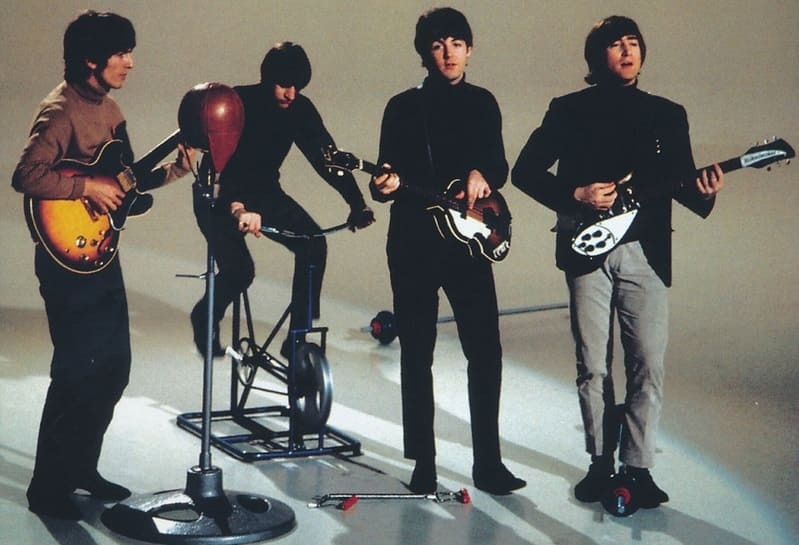 For example, The Beatles’ ‘Norwegian Wood’. In 1968, Ravi Shankar together with Eric Clapton and Jimi Hendrix convinced George to concentrate on the guitar again. On this subject, Harrison said: “I decided … I’m not going to be a great sitar player … because I should have started at least fifteen years earlier. 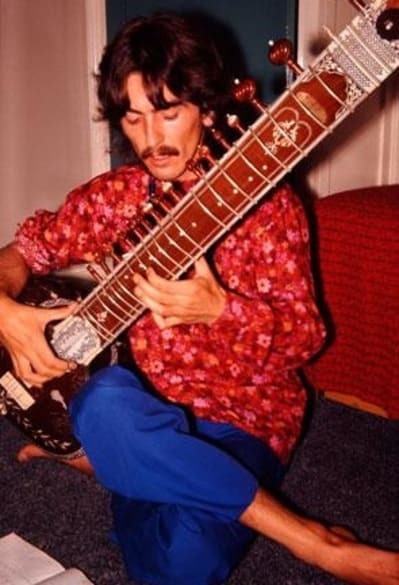 However, George would often use Indian instruments on occasions after this. On the 21st January 1966, with Paul McCartney as the best man, George Harrison married model, Patti Boyd. George met Patti while filming ‘A Hard Day’s Night‘. Patti Boyd was a 19 year old but played the part of a schoolgirl. They got a legal divorce in 1977 due to George’s ‘repeated infidelities’. Furthermore, the ‘final straw’ was his affair with Ringo Starr’s wife Maureen. Patti then married Eric Clapton in 1979. Meanwhile, on the 2nd September 1978, George Harrison married Olivia Trinidad Arias. The couple met in 197 at the A&M Records offices in Los Angeles. The couple had one son together, called Dhani who was born on the 1st August 1978. George was to become a cancer victim in May 2001, with a growth in his lung. But cancer had also spread to hos brain as well. Despite operations and radiotherapy, he died on November the 29th that year in Los Angeles at the age of 58. Since George converted from Christianity to Hinduism, preparations got under way to perform a traditional Hindu ceremony. After his cremation, and according to his wishes, his family scattered George’s ashes in the Ganges and Yamuna rivers. George Harrison may have been the ‘quiet Beatle’ but he makes up for it with his musical talent.